Elf on the Shelf is creepy. The face, the disproportionate limbs, the mythology dating back to the mid-1990s -- it is all creepy, commercialized and secularized. Obviously, it is destined for greatness. The history of Christmas as a holiday and tradition is rife with cultural appropriation, secularization and lots of red-n-green washing. Trees became mainstream thanks to Prince Albert (German) bringing the tradition to England when he married Queen Victoria. Germans carried the tradition elsewhere as well, including into the Church! 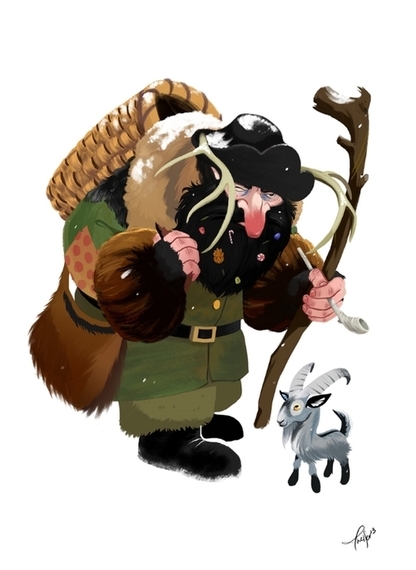 One such folklore figure is Belsnickel (also known as Persnickel) and much to my surprise he's from the portion of Germany from which my ancestors hailed -- Palatinate, along the Southwestern border. Belsnickel was a companion figure to Santa Claus or St. Nicholas. He is described as a human dressed in furs and bearing a switch. He served in a scouting role, checking to see which of the little German boys and girls had been naughty and nice. He beat the ones who were naughty. Companions were often used to highlight the dual nature of the legend -- rewarding the good, punishing the bad. Some reports suggest that Belsnickel resurged as a secular tradition as the Lutheran church moved away from things associated with the Catholic Church. The Belsnickel shows up at houses 1-2 weeks before Christmas and often created fright because he always knew exactly which of the children misbehaved. He is typically very ragged and mean looking. He wears torn, tattered, and dirty clothes, and he carries a switch in his hand with which to beat bad children. The children escape unharmed, but they are scared into being good so that Santa will bring them presents on Christmas. Belsnickel's role as a scout is right in line with Elf on the Shelf which spies on kids for weeks prior to Christmas. There's obviously a bit of magic at play in their communication (reports) to Santa Claus. It makes sense that American consumer culture reimagines Santa companions as a creepy little elf available for just $29.99 and including accessories. If they sold actual companion stuffies, I'm sure the Belsnickel switch would be a lovely little accessory. A friend gifted us with Elf of the Shelf last year as a joke (ha ha, Jeannette) and he has spent most of the year stuffed into a candle holder on the mantle (don't ask.) Suddenly, he reappeared in our Halloween candy bowl with his hands mysteriously covering his crotch. So I've decided to name him Belsnickel in honor of our shared Germanic heritage and in keeping with the spirit of companions. It is a fusion of irreverence and cultural traditions. In a riff on my hate-hate relationship with the Keurig 2.0, Belsnickel made his first appearance in out kitchen on Thanksgiving Day. He knew I would never look there and is probably monitoring our destruction of Mother Earth. I find the backstories of winter folklore characters add a terrific new twist to my holidays. Most famous among these companions would be Krampus who is super creepy evil monster. Krampus has devotees around the nation hosting festivals, gallery exhibits and parties celebrating his awesome twist on the holidays. A local art gallery in Pittsburgh -- Most Wanted Fine Art -- hosts a Winter Spirits Festival which expands the Krampus-fest to 12 winter folklore characters from across the world. I find the common themes fascinating and expansive. 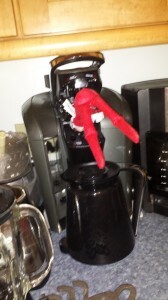 So Bersnickel, the Elf on the Shelf, is joining our family holiday traditions. He'll fit right in with my 100-plus0year-old putz house, date nut pudding and our collection of kitten themed ornaments. Ledcat is thrilled.